If you drive downtown during the next week, you may be surprised by a vibrant, cloud-like structure captivating Cowles Commons. 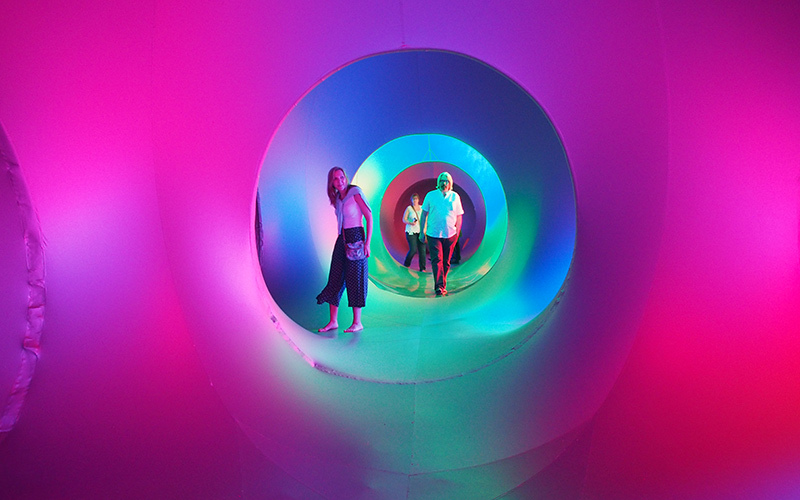 Des Moines Performing Arts’ (DMPA) newest experience for central Iowa is Luminarium – “Albesila,” an inflatable walk-in sculpture, filled with color, light, and sound from Architects of Air located in Nottingham, UK. Architects of Air’s founder and artistic director, Alan Parkinson, began the company in 1992 after his city council asked him to work with troubled youth. This project led him to construct an inflatable air mattress, the first inflatable he made that sparked an idea. “Albesila” and the other six Luminaria currently touring for the company are all handmade, taking about four to six months to complete. “Albesila” was created to celebrate the company’s 25th anniversary. DMPA first partnered with Architects of Air in 2016 when “Arboria” captured the attention of Des Moines. The 2017 “Albesila” is different in structure than “Arboria,” inspired by Islamic architecture and influences of nature, but continues the tradition of intricate ceiling art and relaxing music. Traveling with “Albesila” to Des Moines are three exhibition managers, responsible for installation, training, and advising those hosting and volunteering for the Luminarium. Eric Schrijver, one of the exhibition managers, began working freelance with Architects of Air in 2014 while continuing his work as an architect in Holland. Eric has toured with various Luminaria to Australia, Romania, Hungary, the Netherlands, France, the United Kingdom, Saudi Arabia, and the United States. Eric isn’t new to the United States, having lived in the small town of Mount Gilead, OH, in 1998. He continues to be in touch with friends in Ohio, and is excited to see a few who may come to Des Moines for a visit. Eric and his colleagues, Matthew Warren from Great Britain, and Laine Goerner from Virginia, will be onsite to welcome guests and answer questions about the Luminarium during its 10-day stay in Des Moines. WHEN: Sept. 28-Oct. 7, 2018 from 9:30 a.m. to 6 p.m.